I would be remiss without a reminder that the ambitious and welcoming River City fiction book club will meet tomorrow night — 7 p.m., Tuesday, May 1 — in the store’s downstairs meeting area. The book to be read is Suite Francaise by Irene Nemirovsky, a gripping tale with its own hard-to-believe back story about how it was finally published after all these years. The RCB fiction club’s meeting kicks off a big week of book club gatherings at the store. If you haven’t yet joined a club, I’d urge you to consider doing so. They are fun, free and full of fine folks. Some of them even eat food, to use another word that starts with the letter F. All also receive deep discounts, though that’s switching to D-words. Aren’t Adam Gurno’s book reports great? I, for one, think they are. And I say that not just because once in awhile they provide some online ink for little old me. I appreciate reading the other submissions and it’s terrific when books — no matter their source — receive attention in the crowded world of cyberspace. As you likely saw, this week’s report featured titles in River City Books’ current batch of bargain books. So I thought I would play off that theme with this photo (click to enlarge; if only my brain were so malleable! ), which also offers continuation from what I was discussing the other day: some changes at RCB. 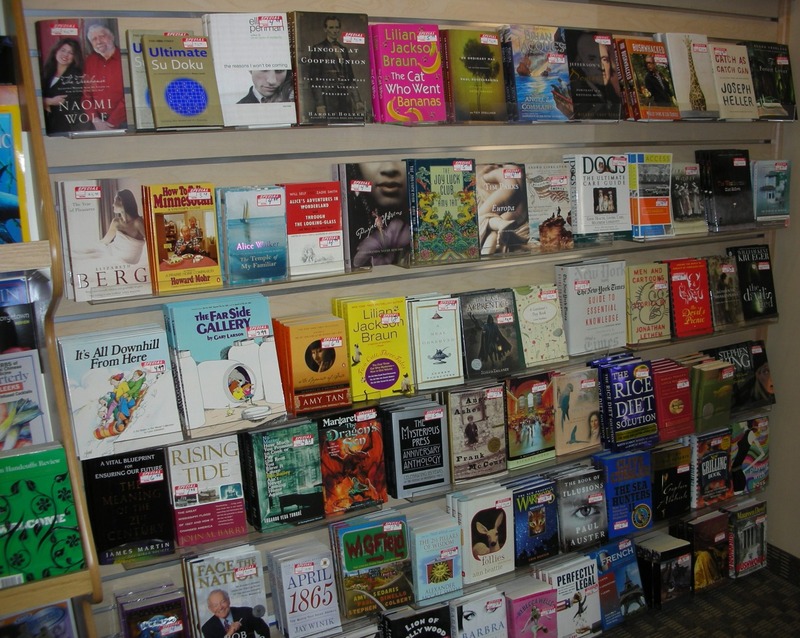 In addition to the store’s ongoing bargain basement and the tables of bargain books near the front of the store, there is now — and this is new — two large displays of bargains near the newsstand. Just last night I was talking with a fellow customer about some great deals on that wall — she found one on her own and took my recommendation on a second title — and I certainly appreciate the prices. But I also think the display is visually appealing in its own right. Wouldn’t you agree? As most know by now, Pulitzer Prize-winning journalist and author David Halberstam died this week. I read several of his books and enjoyed everyone of them. More importantly, they provided a depth of knowledge I would not have received from anywhere else. Among the many tributes this week, I caught Fresh Air’s look back at his career, a show that included multiple interviews conducted over the years. If you’re a Halberstam fan, I think it’s worth a listen. Of course, there’s also one more Halberstam book yet to be published. Do You Hear that Display? If you’ve been inside my favorite bookstore recently you probably noticed a few changes. If you haven’t been inside my favorite bookstore recently I am sure you have a good answer for yourself. I had a chance to peruse the new layout and this is the first of multiple posts on this topic. As I have reported previously, River City Books is now in the music business. They sell an eclectic variety of music, including many titles played in the store. Store manager Jon Lee has a keen ear for tunes and a soft spot in his heart for Bob Dylan. Point is, I think you’ll enjoy offerings you can’t find just anywhere. 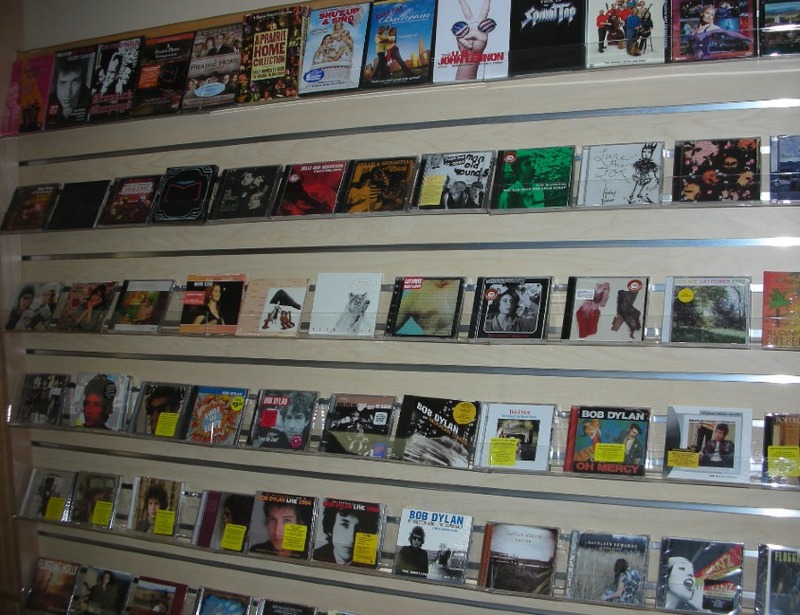 The ever-expanding inventory of CDs has been moved to the wall near the front of the store (adjacent to the bestseller case). The popular music is on the left and the St. Olaf College music is on the right. In addition, the top row includes several DVDs with musical themes. Also, on the ledge at the bottom of the wall are music magazines and a few music books. If you see pattern to this particular area of the store you win a special prize that only I can see. River City Books and The Contented Cow have teamed up on several events of late and, if you ask me — wait, this is my post; I don’t need you to ask me — it’s terrific to see two downtown businesses join forces to serve Northfielders. It’s one of those win-wins that people are so crazy about. Whether it’s Harmon Leon serving up the laughter or an open-mike with come-as-write-em poets filling the air with verse, it’s great to be able to sit, have a cold one (or hot chocolate!) and enjoy a casual evening with a literary twist. Here’s hoping it’s the start of a beautiful friendship. Oh, did I mention River City has that movie for sale? I am a cross-promoter of rare abilities. I’ll go away. But before I do, click below for the (short) last gasp of poetry night. The thing I appreciate about events like open-mike poetry night is that I get the opportunity to hear concise, thought-inducing words fill up my ears. I don’t always follow every line — sometimes I am still in the first stanza savoring a clever phrase that spoke to me while the writer has long moved on — and I’m not sharp enough (shuddup!) to unpack all the good stuff a great poem has to offer (those of us in the ornithological sect are visual learners). But I don’t have to be to get something out of it. I get a type of pleasure from the spoken word that I don’t receive from the printed page. Plus, it’s just fun to be around writerly types in an atmosphere that is anything but stuffy and pretentious. I am telling you, you don’t have to spend every Saturday night reading Shakespeare to take part — and have a hoot — in such an entertaining evening. Speaking of which, there is more where that came from. I see that the Northfield Arts Guild is sponsoring something called Potluck of Poems this Friday night. Looks great. 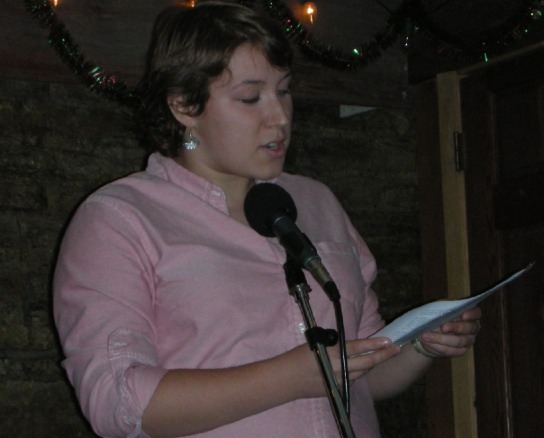 Plus, River City Books poetry maven Stephanie Walker reports that the store is hosting an informational meeting about a new River City Books poetry book club with an eye on additional open-mike poetry nights at The Cow. 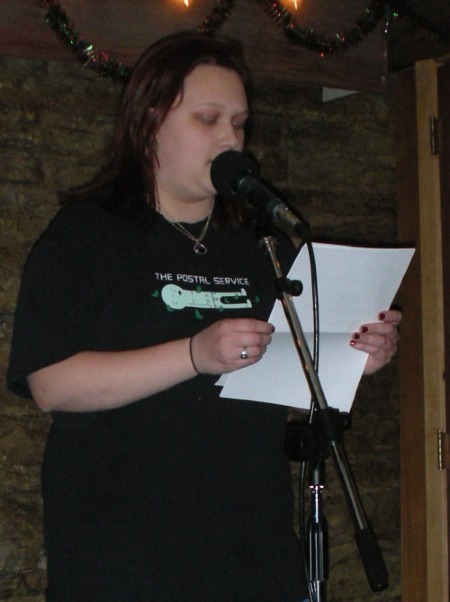 Click below to hear another poem from Thursday night (in this case, the poet reading is different from the one pictured).